Daniel Samohin of Israel vaulted from ninth place to grab a historic gold, the first title for Israel at an ISU Figure Skating Championship. Canadian Nicolas Nadeau came from eighth to claim the silver and USA’s Tomoki Hiwatashi moved up from sixth to earn the bronze medal. It wasn’t the prettiest night of skating at Junior Worlds in Debrecen, Hungary, on Friday, but it was surely exciting. Nearly none of the skaters remained in their respective place after the short. Many produced a new personal best in the free skate, including the top three skaters, while others plumented. Samohin had stepped out of a triple flip in the short, a costly mistake, but rallied back in the long as if he had nothing to lose. The skater hit three quads (quad toe-triple toe, quad Salchow, quad toe), a triple Axel and three more triples, earning 165.38 points and 236.65 overall. It was an emotional moment for the California-based skater. The 2015 U.S. Classic champion felt it was akin to a birthday present. A year ago Nadeau finished far off the podium at 25th, failing to even qualify for the free skate. Not this time. The French-Canadian ranked eighth in the short after reducing his combo to a triple Lutz-double toe. In the long, he landed two triple Axels, one in combination with a triple toe, as well as four more triples. Although he underrotated his quadruple toe loop, the 18-year-old scored 150.86 points and accumulated 224.76 points overall for a second place finish. No one saw Hiwatashi—a substitute for the injured Nathan Chen—coming; including himself. However, two clean programs with triple Axels did the job. The U.S. Junior Champion could have even had the silver medal if he hadn’t repeated a third triple jump in the free skate. The Japanese-American from Illinois scored 147.55 points for a total of 222.52 points to edge out Russia’s Alexander Samarin for a surprising third place. Samarin was second coming into the long program, but slipped to fourth as he made several errors (222.11 points). 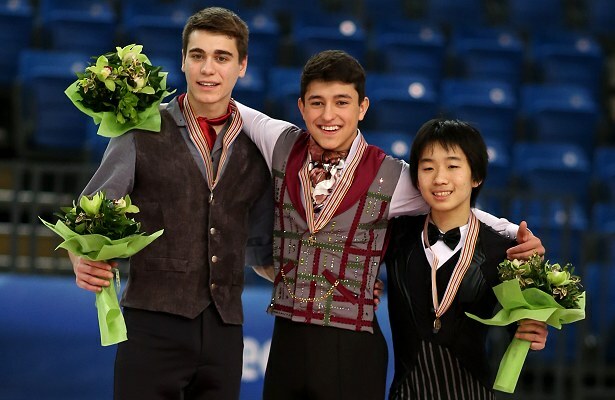 USA’s Vincent Zhou placed fifth although he was fourth in both segments (221.19 points). Russia’s Dmitri Aliev, the leader after the short, fell to sixth after popping his planned quad into a double and making more errors on other jumps (211.18 points). As one of the favorites coming into competition, the 16-year-old was clearly disappointed. Deniss Vasilijevs of Latvia struggled with his triple Axel and dropped from third to eighth (204.75 points).